This week, as Autumn gets underway, many Sydneysiders will be looking to enjoy the last weeks of warm, beach-going weather. Sydney is blessed with an abundance of beautiful beaches, some of which are even internationally famous. The image above shows one which although perhaps not quite as famous as beaches like Bondi and Manly, is extremely popular with Sydneysiders – Cronulla. The word Cronulla is believed to come from an Aboriginal word Kurranulla, which means place of pink seashells, and the beach has long been an attraction to the area. In 1827/1828, Surveyor Robert Dixon visited the area and named several of the beaches, though the main beach was called by the Aboriginal name Kurranulla. When the Illawarra Railway Line to Sutherland was built in 1885, this allowed people to easily access the area and Cronulla became popular for picnicking, fishing and swimming. Many visitors even rented beach houses for school holidays, and The Oriental Hotel was built in 1888 by Captain Spingall to cater for the abundant visitors. 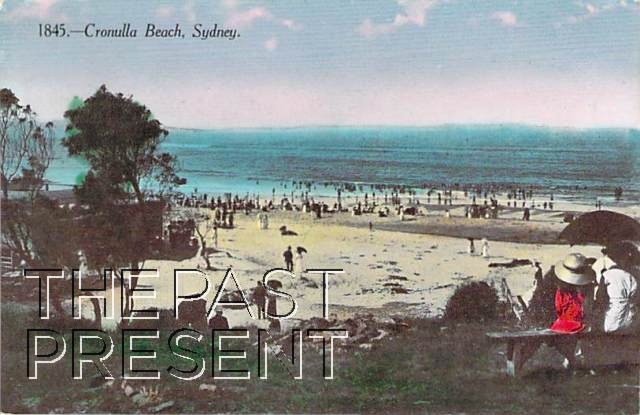 This entry was posted in New South Wales, Sydney Suburbs and tagged beaches, entertainment, history, leisure, postcard collection, sydney, tourism.